← December week 3 – Humor goes a long way (or no where). Epiphany, today, follows the 12 days of Christmas in the Christian calendar. It is the celebration that commemorates the arrival of “Magi” who followed a star to find the Christ Child. It is a season of light which the magi first experienced as they (outsiders) were drawn to one who was said to fulfill the promise of bringing to all people divine liberating love. 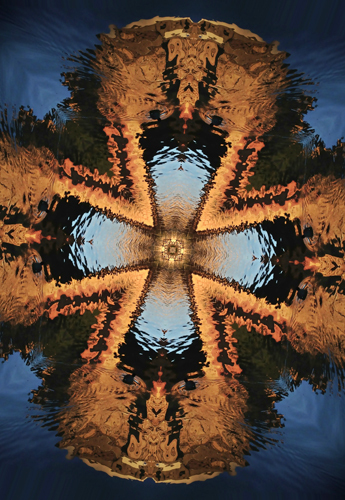 I have been offering you images I create as part of my weekly discipline of visual spirituality. I hope they continue to be for both of us a “revealing scene” that draws us into sacred space, within/out our own psyche/soul. By entering my images may you experience peace, challenge, beauty and liberation – paths to your own epiphanies. This first set of epiphany images, I confess, were captured and created on my iPhone. For most of the year I will be using DSLR (Digital Single Lens Reflex) captures, some traditional photograph skills, and optimization in Photoshop. 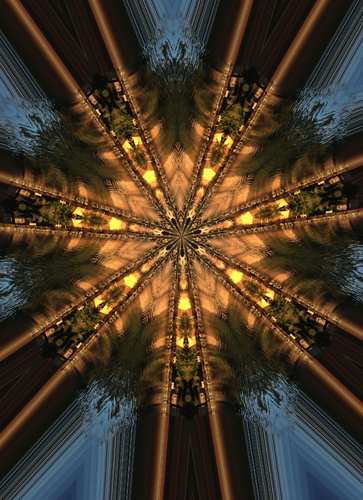 These are “kaleidoscope” images of the San Francisco Palace of Fine Arts. It is a wonderful place to photograph on winter mornings because of the intensity and direction of first light. San Francisco’s Palace of Fine Arts, designed by Architect Bernard R. Maybeck, was originally built for an exhibition that celebrated the completion of the Panama Canal and the city’s recovery from the 1906 earthquake and fire. But the structure was not meant or built to be permanent and would eventually crumble. However in 1960 both concerned citizens and local government had an EPIPHANY: The loss of the Palace of Fine Arts would indeed be a great loss to the future and the people of the city. Fund raising and philanthropic donations resulted in the demolition and reconstruction of the palace in 1964, using plans by Hans Gerson, duplicating Maybeck’s originals. 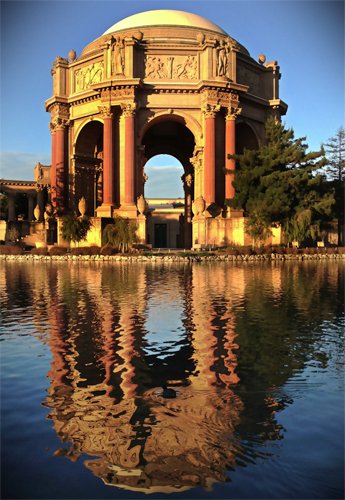 I love to photograph the Palace of Fine Arts and now put creative apps to work on its stunning morning colors and reflections. If this isn’t a “revealing scene” for you then come back next week for the next installment of visual spirituality. I will also provide a few photography (drawing with light) tips! This entry was posted in Weekly 2 and tagged Kaliedescope, Palace of Fine Arts, San Francisco. Bookmark the permalink.